Der goldene Apfel: Eine Geschichte. André Hellé. Grosse bêtes & petites bêtes. Paris: Tolmer & Cie, ca. 1912. 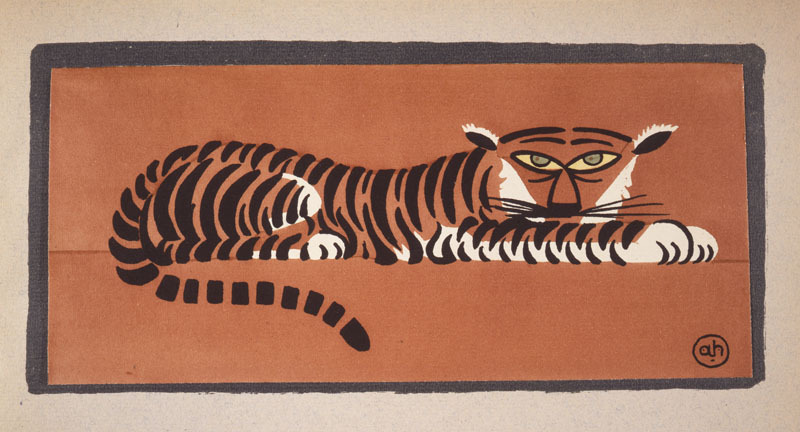 According to The Cambridge Companion to William Blake (2003), The Tyger is "the most anthologized poem in English." And when the Animal Planet television network conducted a poll in 2004, asking viewers to name "their favorite animal," the tiger came out on top at 21%, beating out even man's best friend. (Dogs came in second at 20%.) Moreover, various species of tigers are the national animal for the countries of Bangladesh, Nepal, India, Malaysia, North Korea and South Korea. (Finally something both Korea's can agree on!) All of which proves the enormous tabby cat we call the tiger is a very popular fellow around the globe. That's one reason why Princeton University's Cotsen Children's Library devoted an exhibition to tigers as depicted in its historic picture book collection. Samuil Marshak. Detki v kletke [Children in a Cage]. 3rd ed. Moscow: Detgiz, 1947. 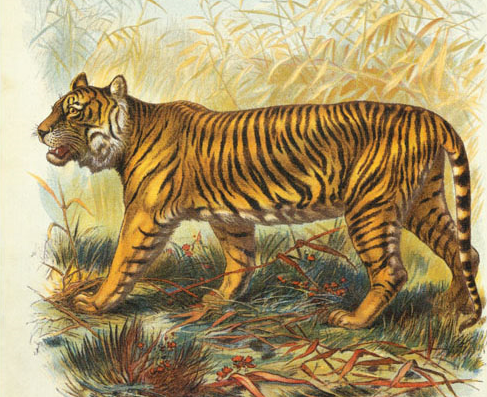 Of course, Princeton University had another reason to celebrate Panthera tigris. Like the Detroit Major League baseball team, the English rugby club of Leicester, and the Louisiana State University football team, among many others, the Princeton athletic team mascot is the tiger. According to the Princeton Parent's Handbook, "Originally, Princeton's mascot was the lion—seen by the administration as the most regal animal. However, in 1867 the sophomore baseball team decided to adorn orange ribbons with black numerals. The orange and black combination stuck and by the early 1880s florid sports writers began to refer to Princeton's teams as the Tigers." Book of Animals. Mounted on Linen. 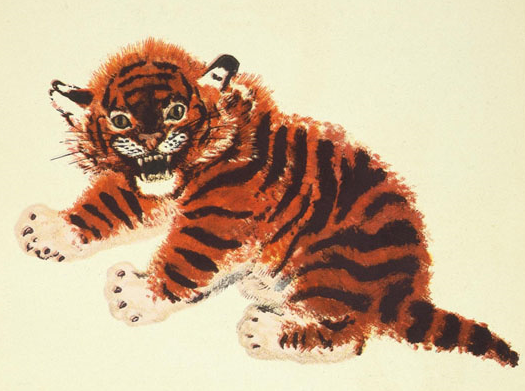 The adoption of the tiger as Princeton's mascot may have been accidental, but that hasn't made it any less beloved. In 2007, after over 125 years of having a nameless tiger symbolize their sporting excellence, Princeton's Athletic department sponsored an online contest to "Name The Tiger." The overwhelming response was: "Don't Name Princeton's Mascot." Students and faculty alike resented the fact that the naming contest took place over the summer, when most of them weren't even on campus. And a Facebook page was created to complain that "commercialization" of the mascot would be an unnecessary break with tradition. In the end, the nameless Princeton Tiger got a graphic "facelift" of its official logo, but remained, as always, unnamed. Bentsyion Raskin. Di hun vas gevolt hobn a kam. [The Hen Who Wanted a Comb]. William Ralston and C.W. Cole. Tippoo: A Tale of a Tiger etc., etc. London, New York: G. Routledge & Sons, . 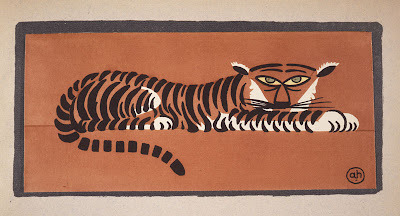 Princeton's Tiger may be forever nameless, but many named tigers have graced the pages of literature. 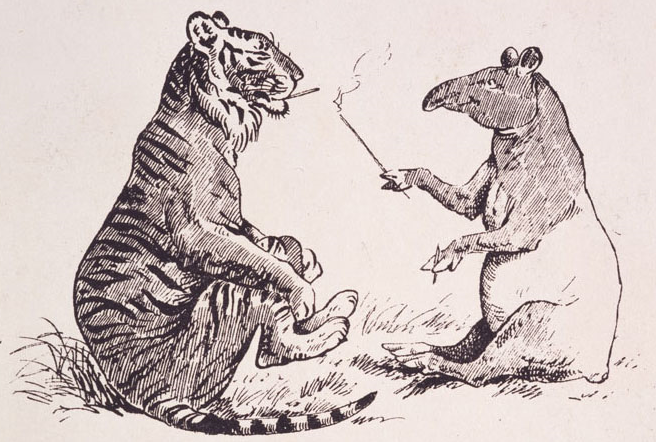 In The Jungle Book (1894), Kipling's deadly Shere Khan got his name from a combination of the Urdu/Hindi name for "tiger "(shere) and that language's word for "king" (khan). 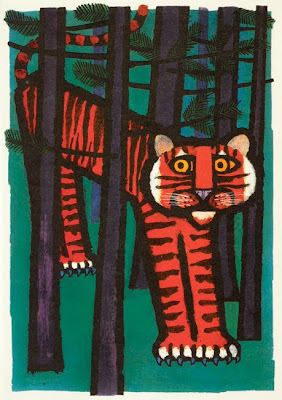 At the other end of the spectrum from Kipling's menacing lord of the jungle, A.A. Milne created the ever-bouncing Tigger, one of the happiest creatures in Winnie The Pooh's hundred acre wood, in 1928. And more recently, the Man Booker Prize-winning, Life of Pi (2001) by Yann Martel featured a tiger stranded on the Pacific Ocean named "Richard Parker." 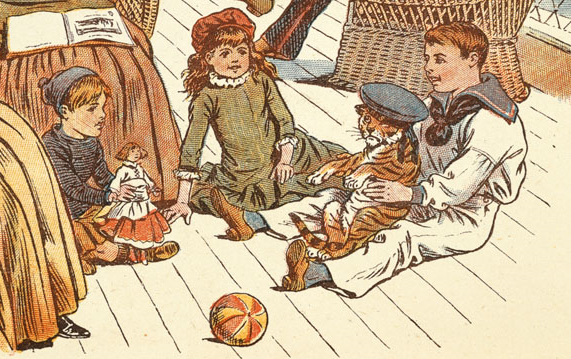 That name, in turn, came from a novel by Edgar Allan Poe, The Narrative Of Gordon Pym (1838), which featured a dog named "Tiger," and a mutinous sailor named "Richard Parker." Harry B. Neilson, author-illustrator. An Animal A B C.
London, Glasgow, Bombay: Blackie and Son Ltd., 1901. 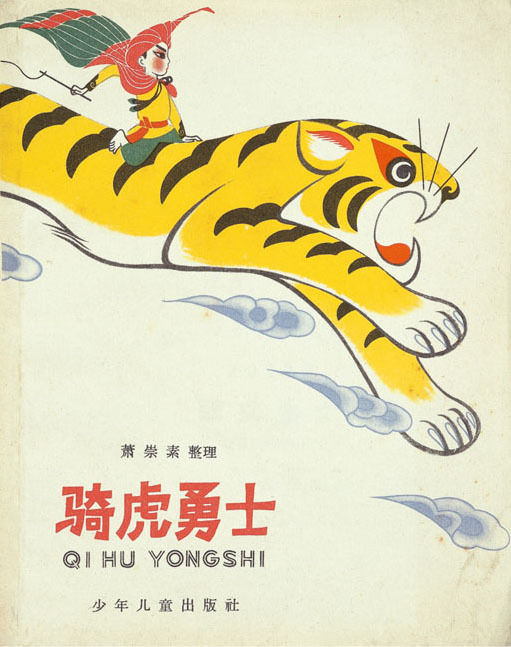 Popular culture hasn't shied away from the majestic tiger, either. The bookish, artistic, and conscientious, Hobbes the tiger makes up the smarter half of the comic strip duo of Calvin and Hobbes. In a much darker cartoon depiction of the tiger, famed political cartoonist Thomas Nast used the big cat to symbolize the evil political machine known as "Tammany Hall." 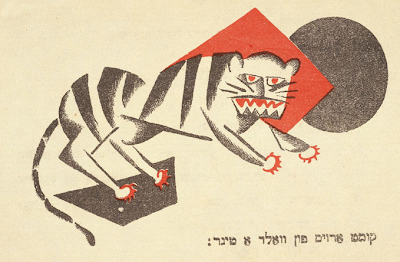 Nast notoriously depicted the corrupt "Tammany Tiger" devouring American democracy. 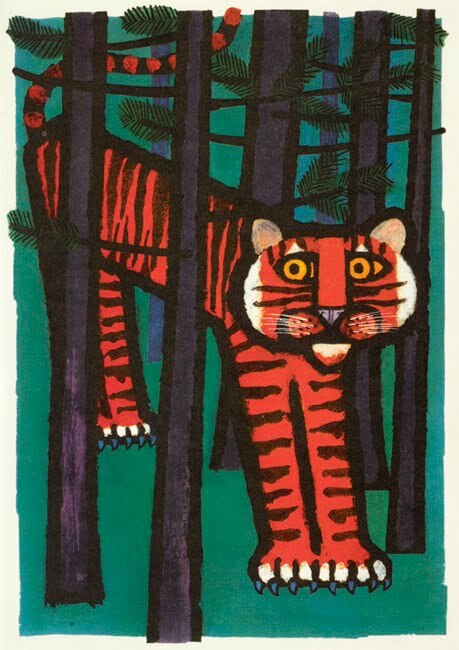 Back on the lighter side is Kellogg's famous "Tony The Tiger." Tony apparently thrives on sugared corn flakes, making him the world's only vegetarian tiger. [Brave Tiger Rider: I Tribe Folk Tales]. Shanghai: Shao nian er tong chu ban she, 1963. The ubiquity of the tiger as an image of beauty, strength, and majesty makes it easy to forget that this magnificent, striped cat is a highly endangered species. According to the website Big Cat Rescue, "Tiger numbers in the wild are thought to have plunged from 100,000 at the beginning of the 20th century to between 1,500 and 3,500 today (2009)." There are now more tigers in captivity than living in their natural habitat. The tiger has become a worldwide symbol of conservation, and one can only hope its popularity with its greatest enemy, man, will allow this amazing creature to escape extinction.